Activists of this group staged protests in front of theatres screening ‘Mersal’ and also tore posters ‘Mersal’ which had actor Vijay on them. Vijay’s ‘Mersal’ is going great guns at the box office with the collections crossing the INR 150 crores worldwide and is still going great. The film is into its third week now and is still going great guns at the box office. However, with so much success came equal share of controversies for the film which has led to a lot of arguments and debate on the film. The controversial GST scene in the film has irked a lot of politicians in Tamil Nadu which has led to many opinions doing rounds and initiating debates. The latest controversy to hit ‘Mersal’ is a protest staged by a Pro-Hindu outfit ‘Hindu Makkal Katchi’. Activists of this group staged protests in front of theatres screening ‘Mersal’ and also tore posters ‘Mersal’ which had actor Vijay on them. In Kumakonam, the protest was led by HMK leader Arjun Sampath who demanded that the screenings of the film be stopped, reports suggest. 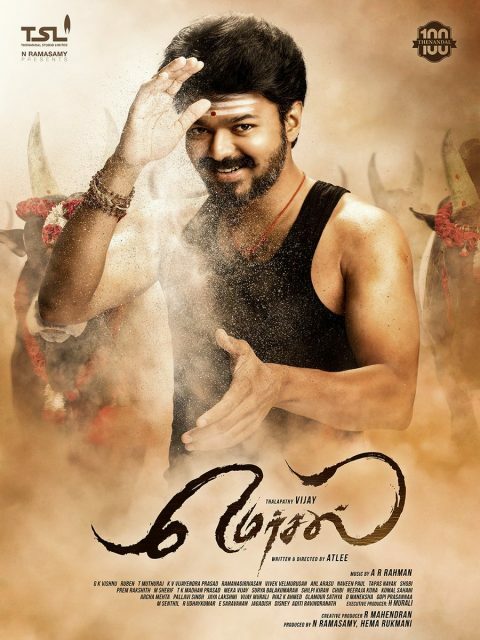 However, no screenings of ‘Mersal’ were stopped neither were any police cases were filed by any theatre owners, reports reveal.